Explore your place in the Rouge River watershed! Zoom to your home, or explore your city. Press the arrow on the top-left corner of the map to open up a panel on which you can turn off or turn on data to control what information you see. Select a feature to learn more about it. Read on below the map for additional information about the Rouge. 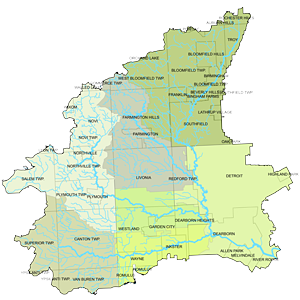 The Rouge River Watershed (land drained by the Rouge River) is a medium sized watershed that drains 467 square miles. 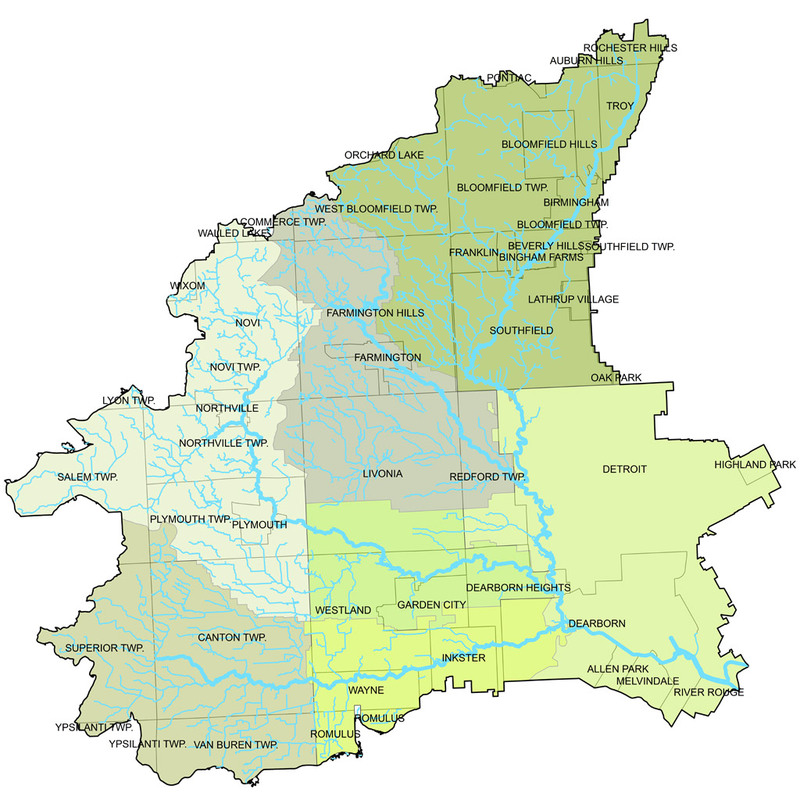 It has four major branches (Main, Upper, Middle, and Lower) with 126 river miles and numerous tributaries. In addition to the flowing water, there are more than 400 lakes, impoundments, and ponds. Within the watershed, there are over 1.35 million people in 48 municipalities. Three counties (Oakland, Washtenaw and Wayne) are part of the watershed and the land is more than 50% urbanized with less than 25% remaining undeveloped. In 1985, the Rouge River was designated one of 43 Great Lakes Areas of Concern, because “…significant impairment of beneficial uses has occurred as a result of human activities at the local level (www.epa.gov/great-lakes-aocs).” This led to the formation of the Rouge River Advisory Council in 1992 and in 1993 the Rouge River National Wet Weather Demonstration Project was created to administer several hundred million dollars to demonstrate stormwater remediation in an urban watershed.